This page will include any updates or corrections to the information in the book. 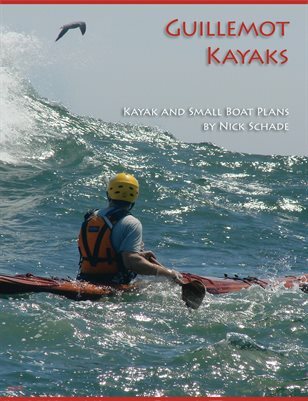 If you see any mistakes in the book, please let me know at Email Nick Schade. The first printing had some small errors in the offsets for the Guillemot. There are a couple whacky numbers in the Keel row of the Buttocks numbers: These errors only show up in the first printing, if you purchased your book recently you should not need to make any changes. These corrections show up as yellow and red below. The location of these mistakes in Figure 4-9 is shown in yellow and red below. I did not include the section of the forms in the cockpit that you cut off in the book because it was not really necessary. If you want to include this, use the numbers in the table below, as shown in the green section above. Make the forms using these numbers to determining the top outline. Pre-cut the cockpit area at the height given for the cockpit recess and tack glue the top back onto the forms. These forms may help you get the strips fair around the cockpit area, but you can do it fine without these extra bits of form. These additions show up as blue and green above. The location of the the cockpits in the Guillemot Double is not very clear. Page 187 gives some guidance of the placement, but if you need a place to start, the front of the front cockpit 6' - 3/4" from the bow and the back of the rear cockpit about 5' - 2 1/4" from stern should work well for many people. Guilllemot Double suggested cockpit location.